Airplane cabins aren’t always known for being roomy, comfy, or luxurious, but the newest crop of first class suites are stunning travelers with their size and opulence. New Yorkers who get by in tiny 100 square foot apartments and Londoners who would pay $145,000 for a shoe box next to Harrod’s may consider moving in when they see how gorgeous and extravagantly large the new cabins seem by comparison. Here’s a roundup of the best and biggest first class cabins that money (or airline miles) can buy. 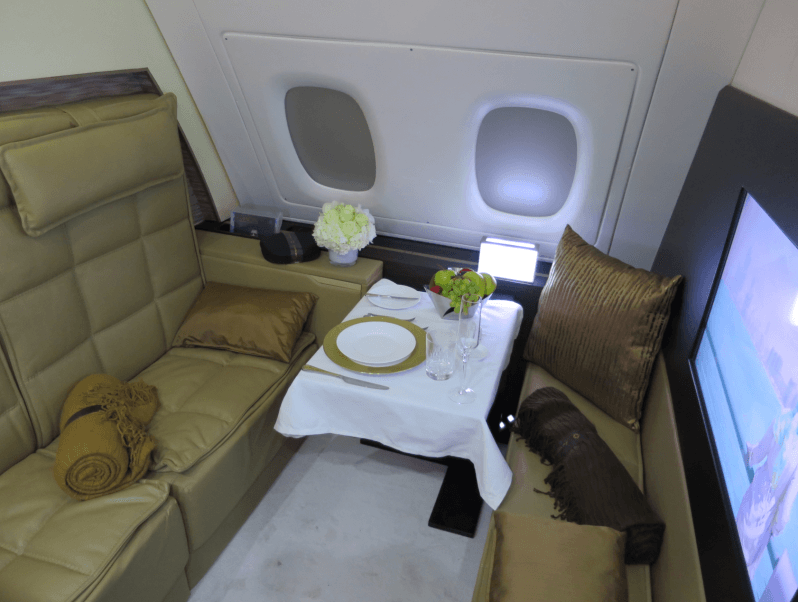 In December 2014, Etihad Airways introduced The Residence on its Airbus A380 planes. The three room suite is a whopping 125 square feet and can be occupied by up to two people traveling together. It includes a living room, a private bathroom, and a bedroom with a bed large enough to share. Etihad hasn’t skimped on the amenities either: It comes with a 32-inch television, a cabinet for chilled drinks, and Christian Lacroix pajamas. The leather on the seats is made by Poltrona Frau, which also makes leather seats for Ferrari and Maserati. The suite also comes with exceptional service. It includes a luxury chauffeur for transportation to and from the airport, and a Savoy Academy-trained personal butler to meet you and the airport and anticipate your every need. The Residence is available on A380 planes between London and Abu Dhabi, and soon to New York and Sydney, Australia as well. A ticket in The Residence can cost about $20,000 one way. If you’ve always wondered what it would be like to travel like an oil magnate or a Russian oligarch, this is the way to go. 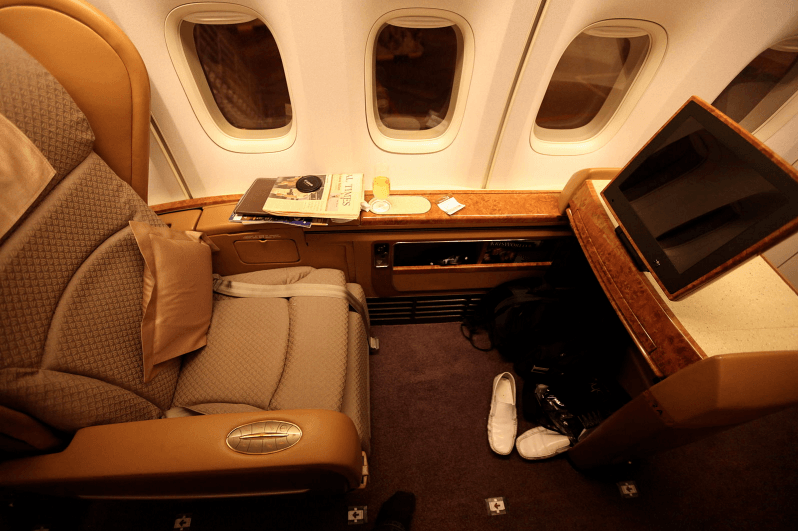 The Singapore Airlines Suites may only feature one room rather than three, but it’s certainly not much of a step down. 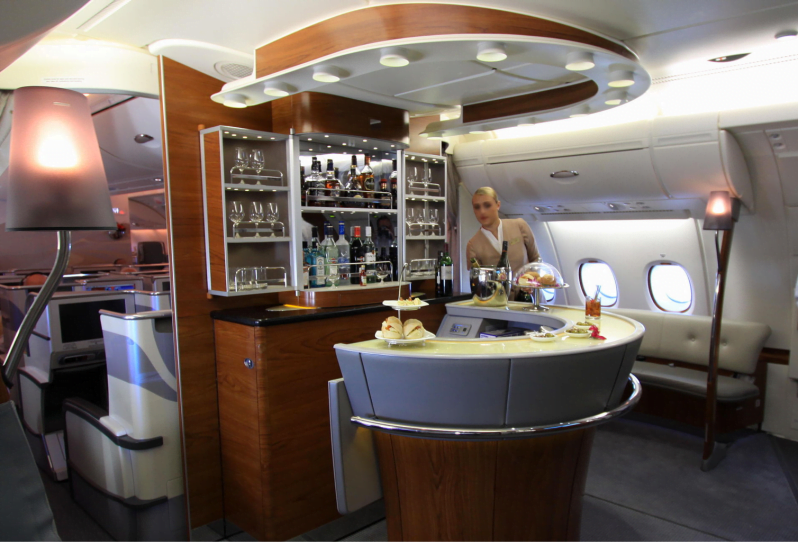 Running about $18,000 each way, the Suites were introduced in 2007 and are available only on the Airbus A380. Flights are offered from Singapore to 14 destinations, including New York, London, and Hong Kong, so there’s plenty of opportunity to experience the best of Singapore Airlines. The cabins are the work of luxury yacht designer Jean-Jacques Coste, and feature a 35-inch wide bed and a 78-inch long bed with cabin doors that can be shut completely. When your partner is in the adjacent cabin, the wall removes so that a double bed can be folded down for some in-flight pillow talk. Each Suite also features a 23-inch LCD screen, Bose headphones, a Ferragamo amenity kit, and Givenchy sleepwear. To complete the perfect in-flight experience, the Book the Cook service allows passengers to order their meals before the flight and choose between Michelin-starred chefs Georges Blanc and Carlo Cracco, among others. At around $13,000 one way, the Emirates First Class suites are a bargain compared to the options above, and their most famous feature will seem like a dream come true: an in-flight shower. In a huge improvement on showering over a toilet in your London apartment, each Suites passenger gets 30 minutes in the spa suite with five minutes of hot water conveniently monitored by a light timer. There are two shower spas for the 14 privates suites on each Airbus A380 flight, and the bathrooms also features heated floors and designer towels and toiletries. Imagine being able to freshen up at the end of a long flight, enjoy a shave or a steam, and arrive at your final destination feeling impossibly calm and collected. Now that’s luxurious. Of course, the cabins in First Class Suites are lovely as well. The seats, which are tablet-operated, fold down to 79-inch beds, and there’s an on-board bar where passengers can mingle with business class passengers over a drink. The cabins also have remote-controlled sliding doors and 23 inch LCD screens for entertainment. Emirates offers chauffeur service to and from the airports in over 70 cities, and flights on the A380 available to over 35 destinations. Maybe it’s time to let go of your lease and take to the skies for luxury and comfort next year.